When you need your carpets cleaned properly it’s a wise decision to call in the professionals. A reputable carpet cleaning company like Cleaning Smyrna will be equipped with all of the tools and the detergents needed to get the job done quickly and effectively. It’s a good idea to do a little research into professional carpet cleaning pros and cons so that you can be sure you’re getting the best possible clean for your money! Each carpet cleaning method comes with both advantages and disadvantages. Wet cleaning of carpets includes hot water extraction methods and dry cleaning involves chemical powders applied by special machines. 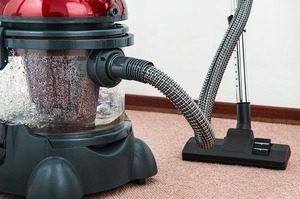 This article will help you to determine the best method for your individual carpets before you ask the experts to visit. This method uses very hot water which is forced into the carpet under pressure. As the water penetrates into the fibers it agitates the dirt and grime to remove soiling from deep within. The chemical reagent liquefies soils and oil-based substances and solutions are then extracted with a vacuum. It’s a common method recommended by carpet manufacturers and professional cleaners for its high rate of success. The drawback of this method is the relatively long drying time, but experienced technicians can reduce this by using powerful equipment to aid the process. This may cause the procedure to be more expensive. You also need to establish that the cleaners are highly trained in the use of the machinery to achieve maximum efficiency and results. The bonnet method with the use of an absorbent pad is ideal for light routine cleaning. After the carpet has been vacuumed a chemical solution is sprayed onto the surface. When the reaction time has been reached the absorbent pad or bonnet is placed on the drive block of rotary floor machine and spun over the carpet. This agitates the dirt in the fibers and removes it with the solution. For slightly soiled carpets this technique is ideal as it’s a simple, fast, and cheap. The disadvantages of this method are that it’s not deep cleaning so only the top of the carpet is actually being cleaned. The carpet fibers will actually accumulate dirt at the bottom so would need a more penetrating clean at some time. This with an absorbent compound is another popular cleaning method as it’s a fast drying and effective technique. A powder is made from solvents and cleaning agents and worked into the carpet with a machine fitted with rotating brushes. This powder absorbs the dirt within the carpet fibers before being vacuumed up. Problems may occur when powder gets trapped in carpet pile and causes a build up over time. This is another method which doesn’t guarantee the deep clean of the carpet and could cause a dust build up over a period of time. Dry foam methods of cleaning involve the application of a cleaning solution to the carpet which is whipped into foam and worked into the fibers. After the rotating brushes have agitated the dirt it’s removed with a vacuum. This procedure is fast, effective and quick drying as only a small amount of moisture is used. Cons of this cleaning process are the inability to penetrate deeply enough into the carpet to do a thorough deep clean as high temperatures are not achieved. If the machinery isn’t used properly excessive wetting is possible. Maintaining appearances, health benefits and longevity of the carpet all fall into the pro category. The cons can often be unexpected in the form of extra charges for stain removal and stairways! Now you’ve got all your facts – the choice is yours. Feel free to check out our professional carpet cleaning service.